Why are fights carried out within caves? Its like fighting against the sea with a wave! But Logan does not care - he likes matted hair - plus having a jolly good dance and a rave. Just like Writer: Jason Aaron; Artist: Billy Tan and Steven Sanders; plus Publisher: Marvel Comics in April 2012. Part Three of 'Back in Japan' is like a bi-polar comedian full of woe, because it comprises of a dual problem, a dual solution, and a duel twist at the end. 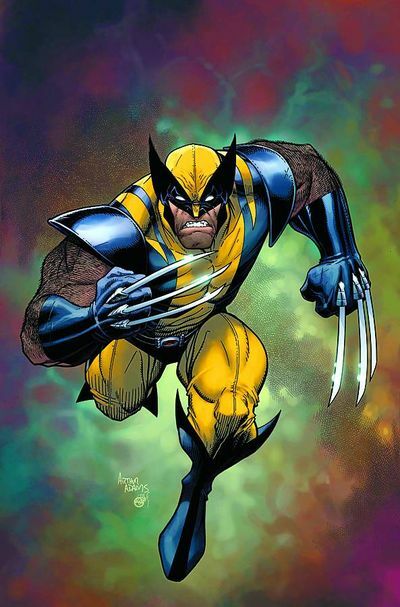 PROBLEM ONE: As soon as Wolverine enters 'the Hand's' cave to commence battle with them, he is immediately overcome by a mind toxin, which causes him to hallucinate that he is in Hell, being tortured by his dead children. Worst still, Mystique and Sabretooth try to keep him their by shooting him in the face. PROBLEM TWO: Thankfully, Wolverine's daughter, Amiko, has some resistance against 'the Hands' mind toxin, and manages to kick the sh*t out of them, until the Dragon who killed her Mother suddenly raises his ugly head. SOLUTION ONE: Over time Wolverine comes to the realization that he is hallucinating, and uses some mind techniques that he has recently learnt, to go bloody mental and slash his way back to reality. Moreover, once he is back on his feet again, he gives his ex-girl-pal, Yuko, a quick bunk-up. SOLUTION TWO: Amiko's boyfriend, the new Silver Samurai, snatches her out of harms way, and then takes her to his Dad's secret stash for safe keeping. A TWIST AT THE END: Opps! Both Wolverine and Amiko have been duped. Wolverine was not making whoopee with Yuko, it was Mystique. Plus when Silver Samurai takes Amiko to safety, she meets his new ally, Hand kingpin, Azmuda Goda. I thought the short tête-à-tête between Mystique and Sabretooth just after she shot Wolverine in the face, was very funny in a perverse sort of a way. SABERTOOTH: Bringing you back from the dead made you feisty. I like it. MYSTIQUE: He killed me. Nobody ever killed me before. SABERTOOTH: Sooner or later, we all kill each other babe. No reason to take it personal. MYSTIQUE: When he wakes up I want every inch of his hide on fire with as much misery as I can possibly imagine. How's that for personal? Please note, you can only get this sort of jovial macho dialogue in a comic book, or at a Mormons convention, ha! Now there were quite a few nice little touches that did float my bloat in this tale. But my own personal favorite thing about this particular issue; was the internal dialogue that both Wolverine and Amiko conveyed. Well, not only did it progress the story-line, but it added some personality to it as well. OK, I have to be honest with you, I am afraid to say that this instalment did flimflam a bit too much at times, which inadvertently broke up both the momentum and the pace of the overall story. Honestly, when a 'saga' just flies about all over the place in this very confusing manner, it does give it a 'throw away' flavor that is very distracting at times. STORY: The 'interlude' where Wolverine was trying to learn how to control his mind was a very nice diversion, because it broke up the story while adding something to it as well. Also, I did enjoy Wolverine's sequences in hell as well, because it sort of gave the overall canvas more scope all in all. ART: Again, like last issue, this issue had the same two artists on it, Billy Tan and Steven Sanders, both with contradicting styles. Bill's style is detailed and earthy. Steven's style is simple and cartoon-like. Too contradictory together. Just fine apart. Say no more. SABERTOOTH: Just have a good look at the ugly looking sod, Jason Momoa, and tell me that he does not look like a man who would stab you as soon as look at you. Go on - tell me! MYSTIQUE: Lead singer of indie pop-group 'Florence and the Machine', Florence Welch, looks like a haunted artist who could shoot her boyfriend in his face if he killed her first. Be Like Bill Clinton Kids - Never Inhale - Or Else Your Mind May Go To Hell Like Wolverine's. Do you know what? Because Florence Welch was on my mind due to my previous answer, I think Florence and the Machine's anthem, 'Shake It Out ', is a very appropriate reply to this question, huh? Well, they both conveying a tale about 'getting rid of something', and are also a bit... err... alternate too. Regrettably, I am afraid to say that this issue of Wolverine was a bit of a naff read generally. The plot was meandering. The art was inconsistent. Plus the discrepancies in pacing and character did not really sit to well with me overall. Still, I hope that Jason can pull something out of the bag for next issues finale, or else I will have to take a sniff of 'the hand's' toxin myself, ha!